Constructed near the end of the 15thC, the Villa Origo’s origins were humble as a highway inn. 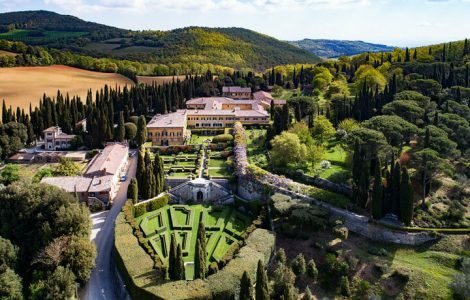 Soon after, it became an estate owned by the Santa Maria della Scala hospital in Siena before it was purchased by the Origo family in 1924 and transformed into the dreamy homestead it continues to serve as today. 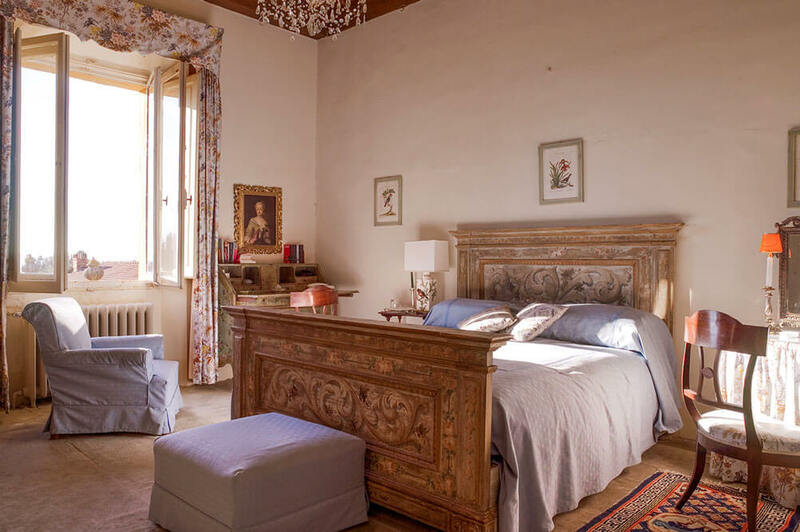 Built in three tiers on the slope of a hill, the villa is adorned with frescoed walls, a library brimming with leather-bound books, and log fireplaces, keeping the atmosphere both cozy and elegant. Step outside into the vast English gardens, famous worldwide and drawing visitors for weekly guided tours (note: visitors are not allowed to roam free during the visits, so your privacy remains intact), and a sprawling 450 hectares of rolling hills and valleys for as far as the eye can see. You’ll find nestled within the grounds a swimming pool, a lemon grove, and a Pergola peppered with rose and wisteria where dinners are usually held al fresco. With incredible gardens, an outdoor pool and a lovely children’s playroom, Villa Origo is perfect for families and intimate gatherings with friends. The grounds are massive, so privacy is ensured. The main villa houses 10 bedrooms. In addition, there is a private apartment area that can accommodate up to 6 people; ideal for children and nannies. Favourite Feature The villa has an amazing organic vegetable garden. The kitchen is stocked with sauces, preserves, and oils all handmade from the produce! What a great way to spend time with your family, exercising, and experiencing a different culture. In addition to the villa’s expansive grounds, it also boasts a private pool, extravagant gardens and children’s game room. Villa Origo houses ten bedrooms and 9 bathrooms within the property’s elegant walls. It also features a private apartment area accommodating up to 6 people, which is ideal for children and nannies. It has a capacity for up to 18 guests. In the main villa, there are three double rooms available, and one single room, all of which have en-suite bathrooms. 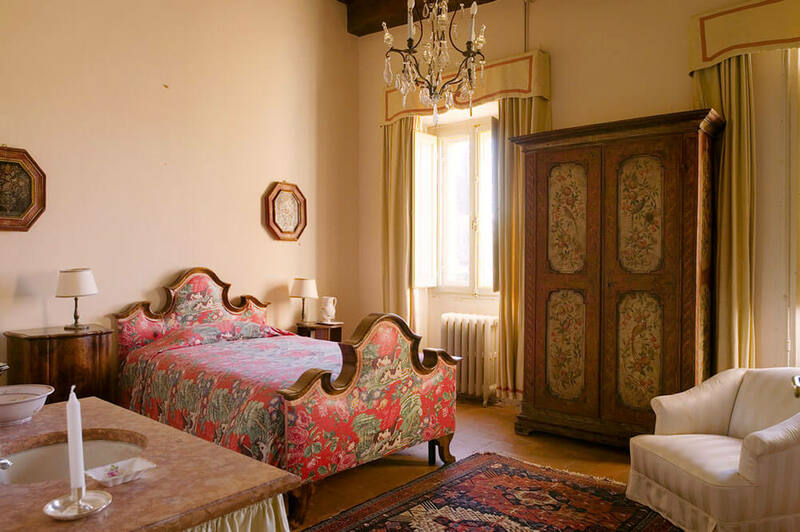 All rooms are elegantly decorated with antique furniture and charming textiles. In the upstairs apartment, there are two double rooms available, both of which have en-suite bathrooms. There are also two twin-bedded rooms; all feature stunning views over the garden and valley. Discover a few ways to weave Villa Origo into an even grander journey.